Young Katherine both drew and wrote as hobbies, but her first formal training in painting was at the Corcoran Art School in Washington, D.C., in 1919–1920. After she and her mother went back to Italy in 1920, she studied art in Rome for several years, learning conventional techniques and styles. She particularly enjoyed painting outdoors in the Roman Campagna with teacher Oronato Carlandi and fellow students. Much later, Sage stated that "these were the happiest days of my life", and she told friend and gallery owner Julien Levy in 1961 that her campagna experience shaped her "perspective idea of distance and going away." Nonetheless, in later years Sage usually claimed that she was self-taught, perhaps because, as one of her biographers, Judith Suther, states, most of what she had learned in Rome bore so little relationship to the kind of painting she eventually did that "she felt as if she had studied with no one." Sage met a young Italian nobleman, Prince Ranieri di San Faustino, in Rome around 1923 and fell in love with him, believing at first, as she wrote to a friend in 1924, that he was "me in another form." They married on March 30, 1925. For ten years the couple lived the idle life of upper-class Italians, which Sage later described as "a stagnant swamp." She looked back on that time as years that she simply "threw away to the crows. No reason, no purpose, nothing." Her husband was content with their lifestyle, but Sage was not: as she wrote in her autobiography, China Eggs, "Some sort of inner sense in me was reserving my potentialities for something better and more constructive." In Margin of Silence of 1942, forms are figurative, static, and draped. The dark background alludes to feelings of unease with these figures in the foreground. Perhaps spurred by the deaths of her father in 1933 and her sister, from tuberculosis, in 1934 (Anne had joined Katherine and her mother in Italy in the 1920s, and the sisters became quite close during Anne's final illness), Sage left her husband in 1935 with plans to build an independent life as an artist; they obtained a papal annulment of their marriage several years later. In December 1936, as she prepared to leave Italy and move to Paris, Sage had her first solo art exhibit, six oil paintings shown at the Galleria del Milione in Milan. In A House of Her Own, her 1997 biography of Sage, Judith Suther describes these works as "experimental abstract compositions." Sage moved to Paris in March 1937 and rented a luxurious apartment there. In early 1938 she saw the International Surrealist Exhibit at Galerie Beaux-Arts, 299 pieces by 60 artists from 14 countries. She was especially struck by the paintings of Italian artist Giorgio de Chirico, which featured what Magdalena Holzhey, in a book devoted to de Chirico, calls "empty squares and receding depths, shadowy arcades and soaring towers." Sage bought one of de Chirico's paintings, La Surprise, and kept it all her life. This exposure to Surrealism inspired Sage to begin painting in earnest. She exhibited six of her new oils in the Salon des Surindépendants show at the Porte de Versailles in the fall of 1938. These semiabstract paintings, including Afterwards and The World Is Blue, borrowed motifs and styles from de Chirico and the Surrealists but showed hints of Sage's own future work as well. Art historian Whitney Chadwick states that Sage's paintings were "imbued with an aura of purified form and a sense of motionlessness and impending doom found nowhere else in Surrealism." Around this time the artist began signing her works "Kay Sage." Several stories are told about Sage's meeting with her future husband, Surrealist artist Yves Tanguy. One came from Greek poet Nicolas Calas, who recalled that he and Tanguy accompanied Surrealist leader André Breton to the Surindépendants exhibit and were impressed enough by Sage's paintings to seek her out. Calas claimed that Breton was sure that the paintings must have been made by a man. Tanguy at the time was married to Jeannette Ducroq, but they were separated, and he and Sage immediately fell in love. Breton and most of the other Surrealists were much less welcoming. Sage, still well off, was generous with her money, and the group of impoverished artists badly needed such support, but they resented her wealth and what they felt was a haughty attitude that fitted her former title of "Princess" all too well. Her alliance with Tanguy caused a rift between Tanguy and Breton, who had formerly been close friends. Shrugging off this rejection, Sage went on calling herself a Surrealist. Although the Tanguys visited, and were visited by, many members of both the French expatriate and American art communities, such as mobile designer Alexander Calder and his family, they had difficulty keeping close friends. "Again and again Sage is described [by people who knew her] as imperious, forbidding, moody, quick to anger, remote, private, solitary, aloof, contradictory, and unapproachable," Judith Suther writes. Tanguy, though friendlier, became notorious for his behavior when drunk, which included grabbing the heads of other men at a gathering and striking them hard and repeatedly with his own. During these years Sage's art gained a solid reputation among art critics, though she found it difficult to emerge from the shadow of the better-known Tanguy. Her work was regularly included in national exhibits, won prizes, and was sold to major art museums. In 1943, Sage's work was included in Peggy Guggenheim's show Exhibition by 31 Women at the Art of This Century gallery in New York. She had several solo shows at the galleries of Julien Levy and, beginning in 1950, Catherine Viviano in New York. In the Third Sleep won the Watson F. Blair Purchase Prize from the Art Institute of Chicago in October 1945, Sage's first major public recognition. In 1951, All Soundings Are Referred to High Water won first prize in oils at the Eastern States Exposition of Connecticut Contemporary Art, and Nests of Lightning won first honorable mention in the 22nd Corcoran Biennial Exhibition of Contemporary American Painting. Sage and Tanguy had a large joint exhibition at the Wadsworth Atheneum in Hartford, Connecticut—their first and almost only exhibition together—in August and September 1954. In Tomorrow Is Never of 1955, rudiments of architecture enclose suggestions of human forms within. The relationship between Kay Sage and Yves Tanguy was as enigmatic as their art. At the same parties during which he banged his head against those of other men, Tanguy assaulted Sage verbally and sometimes physically, pushing her and sometimes even threatening her with a knife. Sage, according to friends' accounts, made no response to her husband's aggression except to try to persuade him to go home. Friends also said that Tanguy did not like Sage's painting and felt jealous of the fame that came to her. The couple must have shared different feelings in private, however, because all accounts agree that Sage was devastated by Tanguy's death. "Yves was my only friend who understood everything," she wrote to Jehan Mayoux, an old friend of Tanguy's, about a month after Tanguy's fatal stroke. Sage did fewer new paintings after Tanguy died, partly because of her depression and partly because of her decreasing eyesight due to cataracts. Instead, she devoted her time to two projects: preserving Tanguy's reputation through retrospective shows and a complete catalogue of his work, and writing poetry, mostly in the slangy French she had learned in her youth and spoken with Tanguy. With the help of longtime friend Marcel Duhamel—and her own subsidies to cover most of the printing costs—Sage arranged for a book of this poetry, Demain, Monsieur Silber, to be published in France in June 1957. Around 1955 she also wrote a partial autobiography, China Eggs, which covered her life up to about the time she left San Faustino, but she never tried to publish it. One of the chief paintings in a show of 13 of Sage's oils at the Viviano Gallery in November 1958 was called The Answer Is No. This seems to have reflected Sage's own state of mind. She filed her will in Waterbury in December 1958, and on April 28–29, 1959, a few weeks after she completed a massive catalogue of Tanguy's paintings, she attempted to end her life with an overdose of sleeping pills. A housekeeper found her, however, and she was revived. Sage seemed to rally for a while after her suicide attempt. In 1959 and 1960 she underwent operations to remove her cataracts, which she had formerly refused to do. Unfortunately, the surgeries were painful and had only limited success, and by this time she was suffering from other health problems as well, including some that may have resulted from her years of heavy smoking and drinking. During 1960 and 1961, as a substitute for painting, she made small sculptures of wire, stones, bullets, and other unusual materials. Catherine Viviano hosted a show of these objects, titled "Your Move," in November 1961, as well as a major retrospective show of Sage's paintings in April 1960. None of this, apparently, was enough. Sage wrote in a journal in August 1961, "I have said all that I have to say. There is nothing left for me to do but scream." On January 8, 1963, she put a fatal bullet through her heart. Following instructions in her will, Pierre Matisse buried urns containing Sage's and Tanguy's ashes in the water off the coast of Tanguy's native Brittany in 1964. Kay Sage is known chiefly as a visual artist. However, she also wrote five volumes of poetry, chiefly in French, including Faut dire c'qui est, in September 1959. She wrote four short plays and an unpublished autobiography, China Eggs. Critics during Sage's lifetime frequently compared her work to that of Tanguy, who was better known, and usually assumed that, when their work had features in common, those features must have originated with him. More recent feminist scholars have stated that the influence more likely was mutual—what Judith Suther calls "a constant, usually unconscious interchange." Suther and others also point out differences between the two artists: for example, the large architectural constructions that dominate Sage's paintings are quite unlike the smaller biomorphic or metallic forms that people associate with Tanguy's landscapes. Both Suther and Régine Tessier, the latter in a sketch of Sage in Notable American Women: The Modern Period, note key features of Sage's mature work. Most of Sage's paintings focus on free-standing architectural structures, including walls, towers, and latticework, which could represent buildings either under construction or ruined and decaying. Some contain figures that might or might not be human, hidden by flowing drapery. (Le Passage, one of Sage's last paintings, is perhaps the only one containing a definite human figure; even Small Portrait, thought by many to be a self-portrait, is hardly recognizable as a face.) Like Tanguy, Sage often sets her objects on deserts or plains that recede to immeasurably distant horizons. She renders her forms in meticulous, photographic detail, using a gray-green-ochre palette that Tessier describes as "reminiscent of the sulphurous light before a thunderstorm". Critics frequently called Sage's work disturbing or depressing, even when they praised her painterly skill. Sage almost never commented on what her paintings represented or how their seemingly ominous mood should be interpreted. One exception was her statement to a Time magazine critic that The Instant, a painting that appeared in her 1950 show at the Catherine Viviano gallery, was "a sort of showing of what's inside—things half mechanical, half alive." 1936, Galleria del Milione, Milan, Italy (six oils) (actually a three-person exhibition: see S. R. Miller's 2011 and 2018 publications below). ^ Surrealism and Women; Mary Ann Caws, Rudolf E. Kuenzli, Gloria Gwen Raaberg; MIT Press, 1991, Stephen Robeson Miller stated "In preparing for her Matisse Gallery exhibition, Sage executed her most ambitious surrealist painting to date, Danger, Construction Ahead (1940) … This painting illustrates the desolate wasteland that she favored and the dramatic composition, in which large forms are placed close to one side of the foreground, emphasizing distance." ^ Levy, Julien. "Tanguy, Connecticut, Sage." Art News 55 (September 1954), p. 27, cited in Chadwick p. 165. ^ Albany Institute of History & Art: 200 Years of Collecting; SUNY Press, January 1, 1998 "She began to use forms covered by rigid draperies, sometimes suggesting figurative shapes beneath, as in Margin of Silence 1942, also owned by the AIHA. In these works the poetic titles reinforce the eerie mood of psychological desolation conveyed by the combination of veiled and static forms left like relics from a deserted civilization in barren landscapes." ^ Tessier, Régine. "Sage, Kay Linn," in Barbara Sicherman and Carol Hurd Green, eds., Notable American Women: The Modern Period. Cambridge, Mass. : The Belknap Press of Harvard University Press, 1980, p. 618. ^ "Tanguy, Yves | Grove Art". doi:10.1093/gao/9781884446054.article.t083251. Retrieved February 23, 2018. ^ Brightlightsfilm.com Surreal Women: Leonor Fini and Kay Sage Documentaries; May 2006 "Her most famous work, Tomorrow Is Never (1955, ...), shows a kind of architecture of doom, a dead world marked by strange, cagelike constructions that appear to contain trapped, suffocating figures. Most of Sage's paintings lack recognizable human beings,"
Chadwick, Whitney. Women Artists and the Surrealist Movement. New York: Thames and Hudson, 1985. Hubert, Renée Riese. "The Silent Couple: Kay Sage and Yves Tanguy," in her Magnifying Mirrors: Women, Surrealism, and Partnership. Lincoln: University of Nebraska Press, 1997, pp. 173–198. Miller, Stephen Robeson. "In the Interim: the Constructivist Surrealism of Kay Sage" in Surrealism and Women, edited by Mary Ann Caws, MIT Press, Cambridge, Massachusetts, 1991. Mentions the author's illustrated Kay Sage Catalogue Raisonne, in which the works are arranged chronologically, on microfilm at the Archives of American Art (see below). Miller, Stephen Robeson. Double Solitaire: The Surreal Worlds of Kay Sage and Yves Tanguy. Katonah, N. Y.: Katonah Museum of Art/Mint Museum, 2011-2012. One of Miller's books, Kay Sage: The Biographical Chronology and Four Surrealist One-Act Plays (2001), the book's title a reference to his exhaustive 1983 Archives of American Art chronology on microfilm (see citation below), was published to coincide with the Katonah-Mint exhibition, as is stated in the exhibition's catalogue. In his essay in this publication, Jonathan Stuhlman demonstrably shows just how Sage influenced Tagnuy's work. Miller, Stephen Robeson. Kay Sage: The Biographical Chronology and Four Surrealist One-Act Plays, New York: Gallery of Surrealism, 2011. (Note: In 1976, Marcel Duhamel, Sage's literary executor in France, six months before his death, gave her four Surrealist one-act plays to Stephen Robeson Miller with the understanding that the latter would eventually publish them. First listed in Books in Print in 1995 as "date not set" with a Boston, Massachusetts, publisher (Nelmar Press), this book was eventually published by the Gallery of Surrealism, New York, to coincide with the Sage and Tanguy exhibition at the Katonah Museum of Art, Katonah, New York, cited above, of which Miller was curator. Miller included with the plays an edited and revised version of his 1983 one hundred page Archives of American Art chronology on microfilm reel nos. 2886-2888 which extensively incorporated quotations from his interviews and correspondence with people who knew Sage and which forms part of the collection named by the AAA "The Stephen Robeson Miller Research Papers about Kay Sage, 1898–1983". Additionally, included for each year in the Chronology, is the source for each quotation/entry and a list of the titles of the works she had executed during that year, thereby making it a catalogue raisonne of Sage's Surrealist works without illustrations (see below). Miller, Stephen Robeson. "Illustrated Catalogue Raisonne of the Surrealist Art of Kay Sage" on microfilm at the Archives of American Art, Smithsonian Insitution, Washington, D.C., 1983, in which the works appear chronologically. This chronological approach permitted the inclusion of Sage's only print, a lithograph made for the Galerie Maeght in Paris for the exhibition called Le Surrealisme en 1947, and several illustrations of works that do not appear in the 2018 Catalogue Raisonne published by Delmonico/Prestel Verlag. (Stephen Robeson Miller regrets that in his Chronology in the Kay Sage Catalogue Raisonne, published in 2018, there was not time before the book went to press to include the following correction: Sage saw her first Tanguy painting Je vous attends (I await you), 1934, at the Galerie Charpentier in Paris in January 1935, not at the same gallery during the summer of 1936. Proof of this information is the checklist of the exhibition called "Le Temps Present: Peinture, Sculpture, Gravure: 1er Exposition de 1935" held from January 10-28 at the Galerie Charpentier, Paris, with Tanguy's painting listed as number 232, courtesy of the Pierre Matisse Foundation, New York). Rosenberg, Karen. "A House of Her Own: Kay Sage, Solitary Surrealist." Women's Review of Books, v. 15 i. 6 (March 1998), p. 4 ff. Suther, Judith D. A House of Her Own: Kay Sage, Solitary Surrealist. Lincoln: University of Nebraska Press, 1997. The author stated in her Acknowledgements, that Miller had abandoned his book on Sage, but this was not possible because the citation Miller had in Books in Print predated Suther's book's citation in Books in Print, and demonstrated his desire to publish further. Also, Miller and Suther for a period of time had discussed collaborating on a book about Sage, but Miller later decided he did not wish to collaborate with her because he wanted to do his own book, which would be a catalogue raisonne with his commentary about her paintings, Sage's unpublished one-act plays, and his one-hundred page Chronological biography in the Archives of American Art. Tessier, Régine. "Sage, Kay Linn," in Barbara Sicherman and Carol Hurd Green, eds., Notable American Women: The Modern Period. Cambridge, Mass. : The Belknap Press of Harvard University Press, 1980, pp. 618–619. Wikimedia Commons has media related to Kay Sage. "Kay Sage Papers, 1925-circa 1985, Bulk 1950–1965." Archives of American Art, Smithsonian Institution. "Stephen Robeson Miller research material on Kay Sage, 1898-1983." Archives of American Art, Smithsonian Institution. "Kay Sage." All-Art. Accessed December 11, 2011. "Kay Sage." ArtCyclopedia. Accessed December 11, 2011. "Kay Sage." Mattatuck Collections, Mattatuck Museum. Accessed December 11, 2011. "Kay Sage (American—1898–1963)." Accessed December 11, 2011. Morris, Gary. "Surreal Women: Leonor Fini and Kay Sage." Morphizm. Posted May 15, 2006; accessed December 11, 2011. Poosti, Tara. 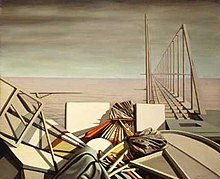 "Kay Sage (1898–1963): Surrealist." Sullivan Goss. Accessed December 11, 2011.